Home: Religion: Shamanism: Shamanism and Medicine. In shamanistic religions a medicine is some magical object or ceremony, such as a medicine bag, that is used to facilitate communication with supernatural forces to aid with healing. In shamanistic religions a medicine is some magical object or ceremony, such as a medicine bag, that is used to control and direct supernatural forces. The term medicine also refers to the magical potential of the object or ceremony which is used for these purposes. Among the North American Indians, a medicine man or medicine woman is someone who professes to have skills at manipulating supernatural forces and uses these skills to cure sickness, drive away evil spirits, and regulate the weather. A Medicine Bag is a traditional North American Indian container for various items of supernatural power. While anyone may have one, usually it would be the medicine man, or shaman, of a tribe who would carry one. As something that holds supernatural items, the medicine bag must also have some power of its own. Typical powers ascribed to medicine bags and their items include increasing hunting abilities, aiding fighting skills, healing allies, hindering enemies and altering the weather. 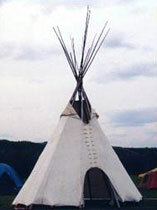 The vision quest is a rite of passage in some native American cultures. Vision quest preparations involve a time of fasting, the guidance of a tribal Holy Man and sometimes ingestion of natural hallucinogens. The quest itself is usually a journey alone into the wilderness seeking personal growth and spiritual guidance. Native American totems can speak through all things and messages or instructions often come in the form of an animal or bird. Generally a physical representation of the vision or message such as a feather, fur or a rock is collected and placed in the seeker's medicine bag to ensure the power of the vision will stay with the individual to remind, protect or guide him.